Celebrated animator and illustrator Wahyu Ichwandardi has peeled back the pixelated curtain on his latest project, and it’s a must-see for any self-respecting Star Wars fan. 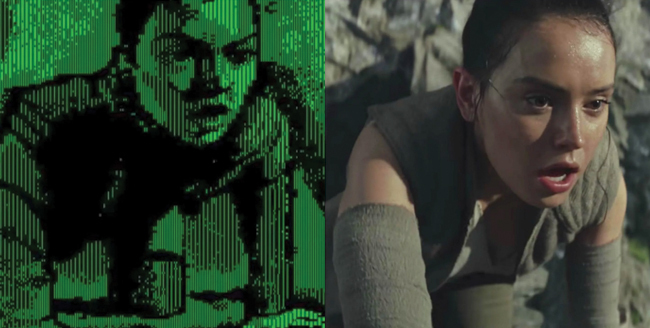 Ichwandardi spent three weeks recreating the original teaser for Star Wars: The Last Jedi using only a vintage Apple IIc from 1984. The process involved working with bitmap paint program Dazzle Draw, and wound up requiring 48 floppy discs, 288 image files, and 6MB of storage space – a far cry from today’s standards. Once the initial trailer had been completed, Ichwandardi then began post-production through the Apple Disk Transfer ProDOS software, while a floppy disc emulator allowed him to transfer those image files onto a modern MacBook Pro. The end result is a retro-inspired gem, one that can easily rival the numerous LEGO trailers that recreate some of the biggest teasers in Hollywood brick by brick. For a more thorough overview of Wahyu Ichwandardi’s creative project, we implore you to check out the behind-the-scenes video embedded below, which takes you through the painstaking process step by step. Luke Skywalker himself Mark Hamill certainly approves of Ichwandardi’s efforts, anyway. If it’s more behind-the-scenes action you’re after, just yesterday Lucasfilm boss Kathleen Kennedy shared a series of moving photos from the recent Vanity Fair shoot, offering up a fleeting peek at the casino planet known as Canto Bight and, more specifically, its eccentric inhabitants. There’s also a rather poignant shot of the late, great Carrie Fisher standing alongside her screen sibling Mark Hamill, as the two recreate the famous Skywalker pose from the original Star Wars trilogy. The Last Jedi, meanwhile, will light up the big screen on December 15th and with any luck, we should have the film’s first full trailer for you once the annual D23 event kicks off next month. Watch this space for more.